By now, we can see that most of the Thames crossings are steel or iron deck arches. 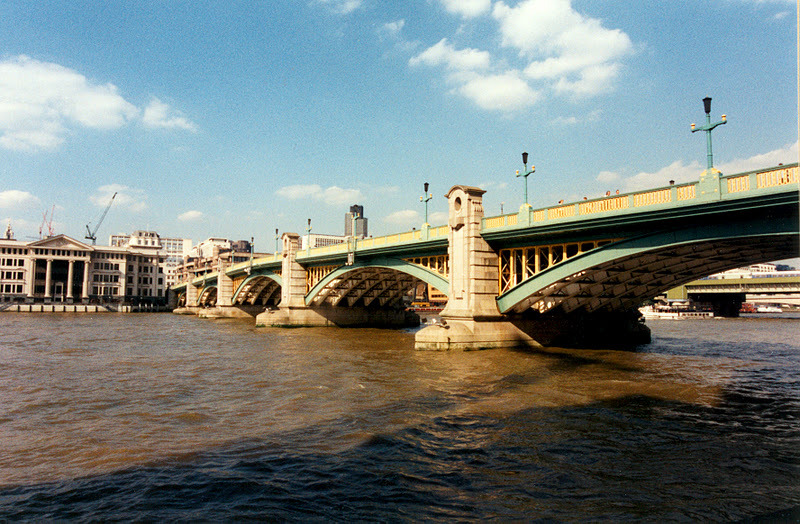 Southwark Bridge is just downstream from the two Blackfriar Bridges. In fact, its five steel arches are aligned with nearby bridges to prevent crosscurrents from occurring with the tides. The current Southwark Bridge was designed by Ernest Lamb and Basil Mott and completed in 1921. The architect (Ernest George) provided viewing platforms above the piers and cruciform lampposts along the baluster. This is an example of a bridge becoming less attractive due to the architect's contributions. Starlings were provided on both sides of the bridge as the current can flow in both directions. The bridge is 800 ft (244 m) long, 55 ft (17 m) wide, and its owned and maintained by the City of London. It was given protected status in 1995. Along the Thames Walk on the south bank are pictures of the bridge construction and a tunnel under the bridge approach shows frost fairs that occurred at this location. Occasionally, the Thames would freeze over and various entertainments would be provided. There are no thoroughfares or nearby train stations adjacent to this bridge and so it carries fewer vehicles or pedestrians than other Thames crossings. In fact, the owners of the original bridge at this site (a toll bridge designed by John Rennie in 1819) ended up going bankrupt. Thames River Bridges: Southwark Bridge by Mark Yashinsky is licensed under a Creative Commons Attribution-NonCommercial-ShareAlike 3.0 United States License.